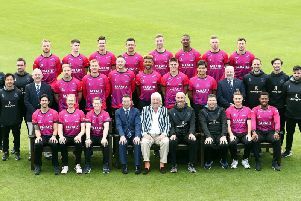 Luke Wright took his aggregate in this season’s NatWest T20 Blast to 522 runs with an unbeaten 92 as Sussex Sharks strengthened their bid for a quarter-final place with an easy eight-wicket win over Glamorgan at Hove. Sussex made short work of as target of 165, reaching it when George Bailey hit the third six of the 15th over from Dean Cosker to seal only their second home win in the South Group but one which should guarantee a top-four finish with two games still to go. Glamorgan’s total of 164 for 7 looked competitive at halfway as they chased a third successive away victory but Wright and Nash produced another punishing stand against them to set up victory. Three weeks ago in Cardiff they put on 116 but went one better this time, scoring 117 in 69 balls with Nash contributing 50 off 32 balls to the third highest first-wicket stand in Sussex’s T20 history. Nash hit seven boundaries and initially took the initiative but once Wright had reached his half-century he went into overdrive, savagely attacking the Glamorgan spinners as he hit Andrew Salter’s off breaks for successive sixes before taking three maximums of slow left-armer Cosker, who came crashing back to earth after spending the last two days fielding as 12th man for England in the first Ashes Test. It was left to George Bailey to hit the winning runs with the 16th six of the Sussex innings. It was the fifth successive game where the side batting second at Hove had won and Glamorgan fill feel that their total was at least 20 runs short. They lost their talismanic opener Jacques Rudolph (18) in the fifth over when left-armer Chris Liddle trimmed his off stump and thereafter Glamorgan needed a solid unbeaten knock of 63 from 46 balls from Ben Wright to hold their innings together. Liddle (2 for 26) and leg spinner Will Beer (2 for 24) bowled with commendable control but the fireworks were provided by left-armer Tymal Mills, who finished with 3 for 34 and unsettled all the Glamorgan batsmen with his searing pace. Mills picked up a wicket in his first over when Colin Ingram gloved down the leg side and he returned to the attack to knock back Graham Wagg’s middle stump and have David Lloyd caught off a leading edge. Glamorgan only got some momentum when Craig Meschede clubbed 20 off an over from Matt Machan, including two sixes, and well though Wright batted in difficult circumstances he never found the tempo that Luke Wright and Nash produced later in the contest.